I’ll never use anything but New Mexico piñon in my candy! David D. Breshears, Laura López-Hoffman and Lisa J. Graumlich published an interesting paper in the journal AMBIO on adaptation to sudden ecosystem crashes that strongly affect the delivery of ecosystem services. They argue that climate change might lead to increasingly frequent events of sudden, large and patchy ecosystem crashes were ecosystems undergo important changes in their structure and functioning. Because the particular timing, location and intensity of ecosystem crashes are generally unpredictable, and that ecosystems can rarely be made resistant to crashes (by definition), stakeholders will have to adapt to the consequences of ecosystem crashe if, when and where they occur. 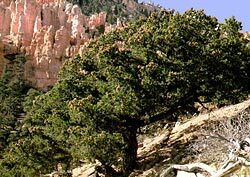 The authors explore how a recent drought-induced tree die-off of piñon – juniper woodlands across the SW United States has altered the capacity of these woodlands to support human well-being. They relate scientific studies of drought impacts on the ecology of these woodlands and accounts in the media of how stakeholders are being impacted and are responding to these impacts. The authors suggest that increasing stakeholder resilience to sudden losses of ecosystem services varies according to how strictly the particular ecosystem services are tied to particular location. They introduce the concept of “portability” to describe the degree to which an ecosystem service is tied to a particular location. As an example, piñon nuts are a portable service (with some limits) while the view from someone’s home is not – but this also depends on how flexible people are in terms of home location. Ecosystem service portability must be analyzed in conjunction with stakeholder or beneficiary’s mobility: i.e. how location-flexible rather than location-centric they are. The paper introduces two concepts – ecosystem service portability and stakeholder flexibility – that are interesting to consider in analyses of vulnerability to climate change in general, and of adaptation options to specific changes in ecosystem properties in particular. Stakeholder flexibility must of course be investigated in conjunction with ecosystem service substitutability: can a cactus replace your beloved piñon in your backyard?